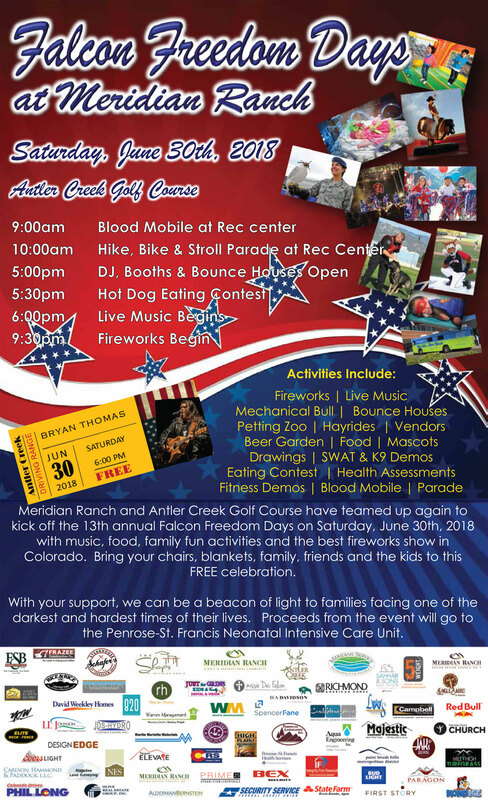 Meridian Ranch and Antler Creek Golf Course have teamed up again to kick off the 13th annual Falcon Freedom Days on Saturday, June 30th, 2018 with music, food, fun family activities and the best fireworks show in Colorado. Bring your chairs, blankets, family, friends and kids to this FREE celebration. With your support, we can be a beacon of light to families facing one of the darkest and hardest times of their lives. Proceeds from the event will go to the Penrose-St. Francis Neonatal Intensive Care Unit.